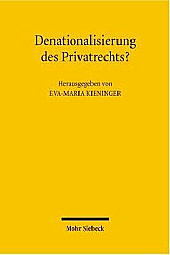 German/English Publication: Denationalization of Private Law? Speeches which have been held to celebrate the 70th birthday of Karl Kreuzer have been published in the following volume: Eva-Maria Kieninger (ed. ), Denationalisierung des Privatrechts? Symposium anlässlich des 70. Geburtstages von Karl Kreuzer. Roy Goode (Oxford), The harmonization of dispositive contract and commercial law – should the European Community be involved?